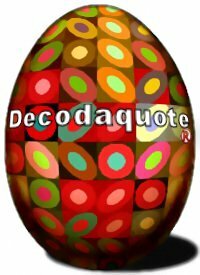 Decodaquote® - Cryptograms of wit, worth and warmth and world of Patience Rayn. Welcome to Decodaquote®, home of the world’s best cryptograms. Decodaquote puzzles are encoded messages, fun and educational for the whole family. They’re great for children and teenagers and they keep us all thinking. Decodaquote fits in a coat pocket or purse, and is designed to fill an idle moment while commuting or waiting in line. Tear apart the thick ones and take what you need to keep yourself entertained for the day. Keep a tablet near your table for a quick pick-up. A frequent mental snack on Decodaquote feeds your brain with good humor, lofty thoughts and warm fuzzies. Featuring new puzzles perfect for hours of fun.